Much of the material was subsequently reprinted, though with considerable textual variants, in Deutsche Zeitung in den Niederlanden and Deutsche Schachzeitung. The magazine CHESS printed extensive English translations (of the Deutsche Schachzeitung version), as did Horowitz and Rothenberg’s 1963 book The Personality of Chess. However, it was not until 1986 that a complete English version of the original Pariser Zeitung articles became available (Alekhine Nazi Articles, an excellent privately printed booklet edited by Kenneth Whyld). In recent years there have also been two reproductions of the original German, by Wolfgang Kubel (1973) and Herbert Griesshammer (1983). Thus Alekhine’s line of defence was not consistent. Sometimes he claimed to have written nothing, but on other occasions said that the anti-Jewish slant had been added by others. The latter possibility is unlikely; once the anti-Jewish slant is taken away there is hardly anything left. Such inconsistencies will be welcomed by defenders of Alekhine, many of whom have suggested that, being forced, for his own and his wife’s safety, to write anti-Semitic material, the then world champion deliberately made it ridiculous and inaccurate. The original Pariser Zeitung publication contained many elementary misspellings of proper names (‘Marschall’, ‘Andersen’, ‘Pilsburry’, etc. ). There is a reference to the match between La Bourdonnais and ‘Macdonald’ (instead of McDonnell) and to a ‘Polish Jew’ named ‘Kienezitzky’. (Kieseritzky is meant, although he was apparently neither Polish nor Jewish.) 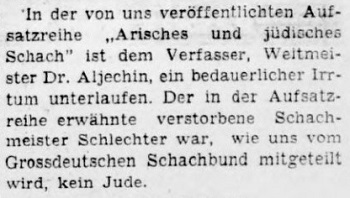 Some mistakes were corrected in the Deutsche Schachzeitung reprint, as were factual errors like the suggestion in Pariser Zeitung that Schlechter was a Jew. But the theory that Alekhine tried to signal his insincerity is mere guesswork which is not even supported by any claim to that effect from Alekhine himself. 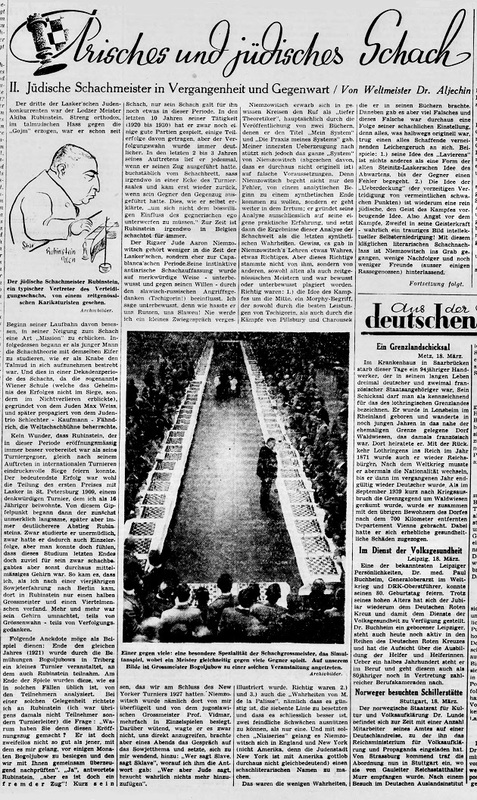 The wrong spellings might just as easily be put down to a Pariser Zeitung typesetter’s difficulty in reading Alekhine’s idiosyncratic handwriting. The Nazi articles affair is one of chess history’s most notorious scandals and intriguing mysteries. Although, as things stand, it is difficult to construct much of a defence for Alekhine, only the discovery of the articles in his own handwriting will settle the matter beyond all doubt. In C.N. 1920 we quoted this and commented: ‘It is a pity that Mr Le Monnier did not answer our straightforward point: if in 1958 he saw an article in Alekhine’s own hand, why, some 15 years later, did he write that ‘it will never be known whether Alekhine was behind these articles …’? C.N.s 3605, 3606 and 3617 reverted to the Alekhine affair, and the third of these items mentioned that French copyright law changed in the 1990s, with the result that the notebooks would not enter the public domain until 1 January 2017. 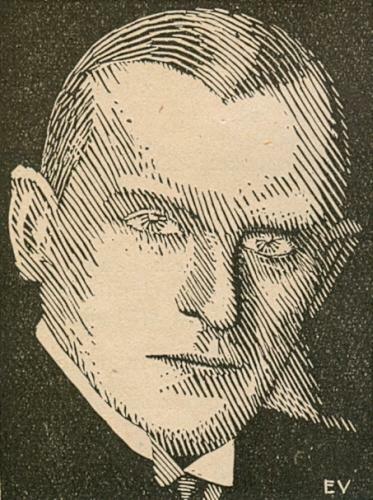 Complete English translations of Alekhine’s articles in El Alcázar and Informaciones were given in C.N. 1455 and are available as a separate feature article. 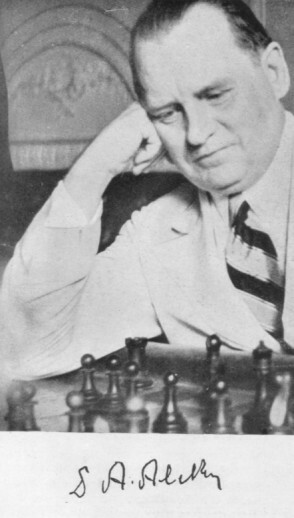 ‘My profound attachment to chess restrains me from telling all I think of Alekhine, since the fall of France. In May 1940, I played against him in Paris (a so-called “consultation” game) and won. I could not have guessed that he would behave afterwards as he did. I shall never play against him again and I do not even wish to see him. I refused to meet him at Barcelona, when he visited that city to give chess exhibitions. I think that the above makes my conception of “collaboration” clear. The chess world is aware of the tragic end of the grand Polish chessmaster and composer Dawid Przepiórka, who was condemned to death for having entered a café where chess was played; he was forbidden to do that, because he was a Jew. 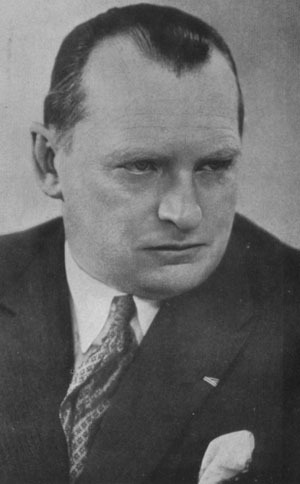 But it is not generally known that Alekhine, though on close terms with the Nazi Governor of Poland, Dr Frank, with whom he was photographed for Nazi periodicals published at the time, refused to intervene to secure Przepiórka’s release. This fact of his non-intervention was told me by Sämisch when he came to Barcelona at the end of 1943. 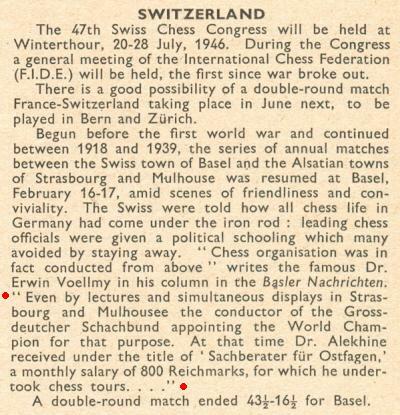 I could also mention articles published by Alekhine after 1940 and the chess exhibitions he gave to entertain the Nazi Forces. I refrain from giving further disgusting details about his behaviour. It could be added that he adopted the Nazi salute “Heil Hitler” with outstretched arm. ‘Dr Alekhine informs us that the attacks quoted in CHESS of Dr Oskam, who was always his friend, were particularly painful to him. “As for Dr Bernstein’s ‘information’, I can only state that my friend D. Przepiórka was murdered before the end of 1939 (I heard the narrative of his [sic] from an eye-witness) and it is known that I played in Germany and Poland only from the end of 1941. What connection could I have with this tragical event?? Regarding Przepiórka, it is believed that he was killed in April 1940 (see C.N. 6618). Such flat assertions are unwise, given that no proof has been found that there was ‘pressure’ or ‘persuasion’. Dominique Thimognier (Fondettes, France) reports that the Gallica site of the Bibliothèque Nationale de France has recently placed on-line a run of the Pariser Zeitung, the newspaper published during the Nazi occupation of France. 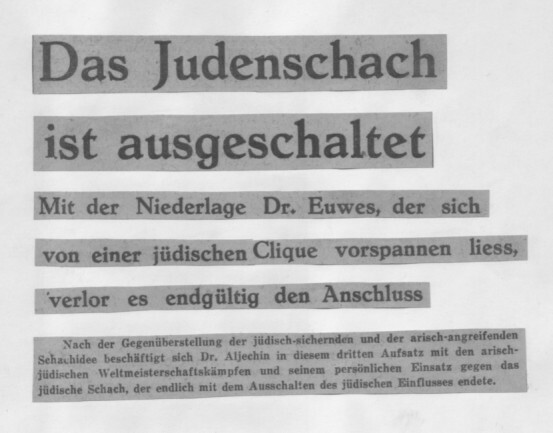 The anti-Semitic articles which appeared under Alekhine’s name were printed there in six parts, on 18, 19, 20, 21, 22 and 23 March 1941. The Gallica project lacks the first part in the serialization, but the other five have been drawn together in a file by Mr Thimognier, together with an introductory note in the 16 March 1941 edition. ‘The newspaper’s chess column was published on Sundays and began on 16 February 1941. Some material was attributed to “A.L.”, who was identified on 23 March 1941 as A. Linder.